The flight was departing at 15:15. We ordered a taxi to pick us up at 12 to have enough time to get to the airport through Bogota’s jammed roads. Friday afternoon is the worst time to get to the airport. Since it was a domestic flight we only needed our resident cards to board the plane. I was sitting in the taxi looking forward to enjoy the Caribbean sun, delicious food and see something new in Colombia. Whenever I told someone that we flew to Riohacha they used to say – where? There is nothing out there. Well maybe, but as I found some cheap flights for a weekend, I thought it would be nice to go there and meet the indigenous Wayuu people – the inhabitants of the Guajira peninsula. I kept wondering about our weekend destination when suddenly I realized that we have our resident cards but the kid does NOT have one but needs a passport to board the plane! Shame on me! I forgot her passport! We had to return to get the passport! And the hell has started. It was very difficult to turn back as the traffic jam was very bad. We finally managed to return but it took us ages to get home to grab the passport. Our driver did his best looking for the best roads to get us to the airport. His navigation program showed only red points and lines that meant an accident or a heavy traffic. We had lost all our faith in getting to the ”never visited destination”. We weren’t moving at all. The driver knew some side roads and tried to take them. We have even thought to simply go back home, as at 14:40 we were still stuck in the traffic and the navigation program calculated that we had about 25 minutes left to the airport. It was nerves wrecking. All of a sudden the road in front of us became empty and we could move faster. But what are the chances to get on a plane departing in 20 minutes still not even being at the airport? But as we were very close we decided to give it a try. Instead of taking the lift we climbed the stairs running with the unfolded stroller we took out the taxi, we got to the security checks (we had our boarding cards on the phone already). I got breathless to the gate at 15:05 (the scheduled departure was at 15:15) hoping that the staff would let us board the plane. One of the staff looked at me told me with the Colombian calm that ”we will be ready to board shortly, please have a seat”. We’ve made it! As it turned out later, the air traffic controllers were on strike and also one of the runways was closed. Deep in my heart I was thanking everyone who was involved in the strike and closing of the runway. Apparently the town of Riohacha really wanted us to come. As we have expected, the town didn’t impress us much. However we found a restaurant with delicious food, we met some friendly people and visited the Wayuu Ranchería where I danced the typical Wayuu dance La Yonna, had my face painted and the Wayuu people told us some interesting stories. I found the beach in Riohacha as one of the nicest beaches of the Colombian coast. And there are no tourists (maybe yet?). Riohacha is located in the north of Colombia at the Caribbean Sea. It is the capital of Guajira department. 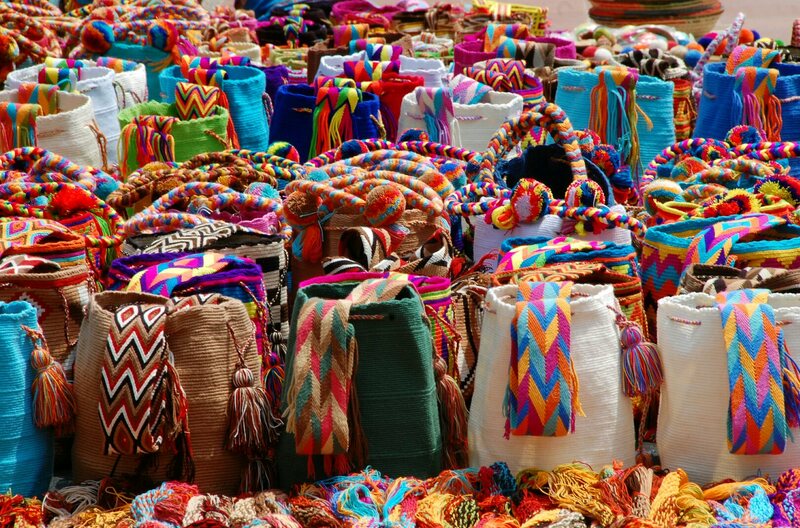 The peninsula is known for the Wayuu Indigenous people and the Wayuu bags (mochilas) they make. Tourists go from Riohacha to Cabo de la Vela. We didn’t go there as the road at the time we were there wasn’t good and the motion sickness of our kid was one of the main reasons to skip the journey of 160 km from Riohacha to Cabo de la Vela.